EmailOctopus, like most SaaS businesses, answer hundreds of questions from our customers a week. Occasionally those questions are frustrating or confusing but those customers are incredibly important to the business and we put them at the forefront of what we do. One way in which we help improve satisfaction and help retain users is by making the support process as streamlined as possible. The support process begins the moment a customer has a question and it’s our aim to resolve that questions as quickly as possible. The first thing we do is try to make our error messages as informative as possible, so users can resolve their own issues without needing to write an email and wait for a reply. In the event that our error messages or FAQ can’t solve their issue, then the next best is to make sure that we’re readily available to our customers whenever needed. We’ve ensured our website is stocked full of links to help users get in touch, much like the one below; allowing customers to send us support tickets via email or via a web form. We have an internal target at EmailOctopus to provide our customers with a response within an hour and a resolution within the day. To help us reach this target we set-up Slack notifications in our specific #Support channel for each new support ticket which comes in. To keep track and to manage our support backlog we use Zendesk, where each member of the team has their own account. This makes it easier for us to assign the emails to the most well-equipped person to handle them. At EmailOctopus I handle all first level support and have the responsibility of assigning each ticket if it’s not possible to answer it immediately myself. The more technical tickets are assigned to Jonathan with partnership and integration requests going to Tom. 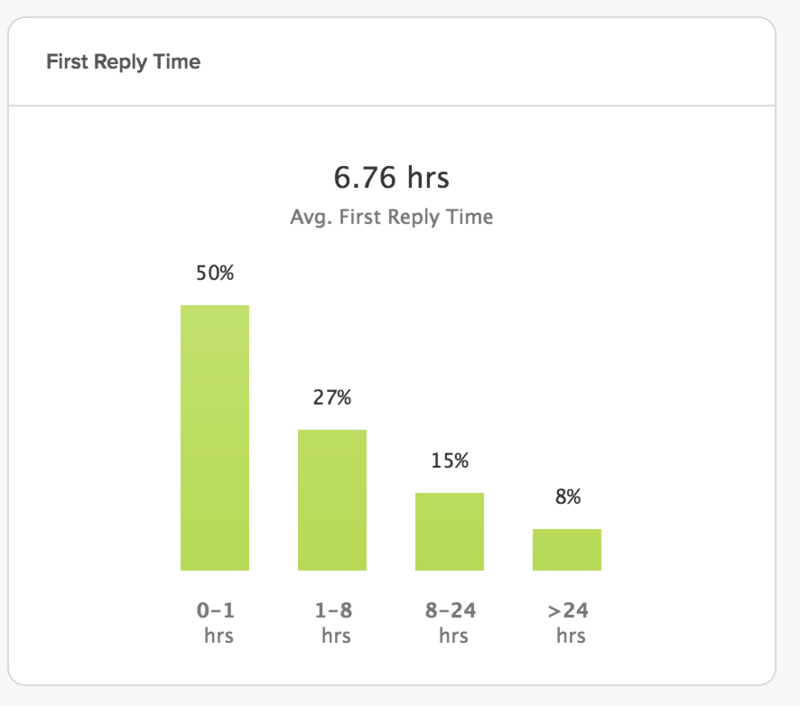 Through Zendesk we monitor and track our statistics for all support tickets; helping us improve the quality of support. With referrals from users of EmailOctopus our biggest method of acquiring users, we aim to be as helpful through our support as we possibly can – even going as far to doing some technical tasks on behalf of our users. 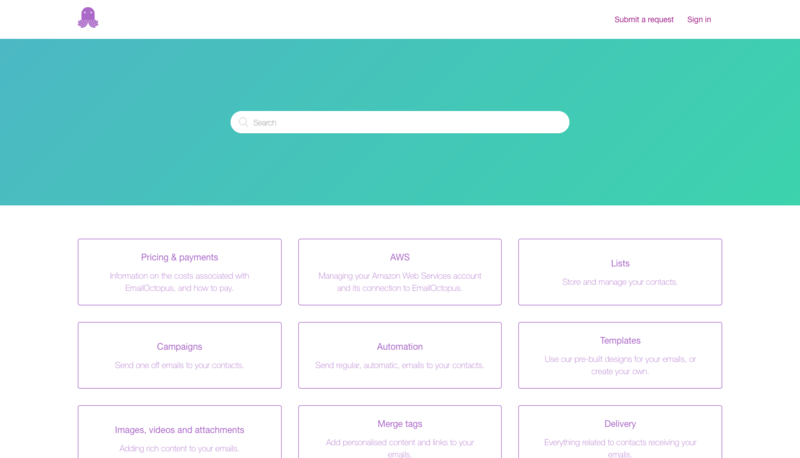 One common example where we lend a hand is in integrating EmailOctopus and AWS, a process which can be quite daunting for less technical users. In all communication with our customers we aim to be as conversational as possible, by providing them with the exact support information they need in a friendly manner. More often than not customers come to us with genuine and honest feedback on how we can improve the platform, usually that’s in the form of feature or integration requests. 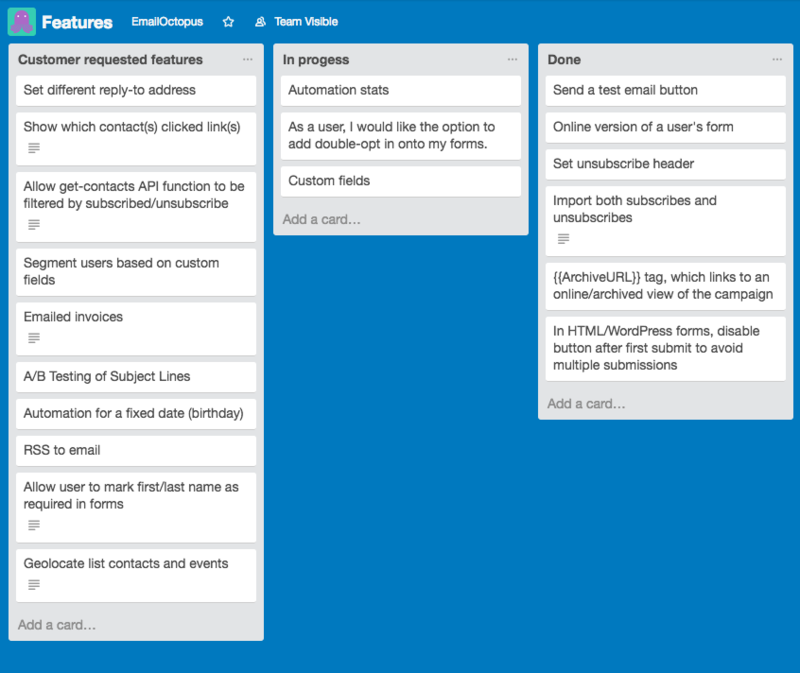 We record each of these requests in a specific Trello board and they’re regularly discussed during both our weekly planning and monthly meetings. As always, there are more requests than the team can implement, so we prioritise them carefully based upon the ease of implementation and also the number of users who have requested a feature. To improve our service, we also monitor support tickets for trends. Recently we noticed a trend in users experiencing difficulty uploading contacts, so we redesigned the whole upload process to make this simpler. In doing so we’ve reduced our workload in support tickets, but more importantly made the platform easier to use and our customers happy. In other case, we can’t solve the issue through technical solutions and instead they can just be added to the FAQ. This too ensures that users who have a common question, can get the answer without a wait. We know that we are not perfect and hence have a constantly evolving platform. But our evolution takes place only takes place with the help of our customers. EmailOctopus grows with the people that use it.